UI’s Student Board hosted a off-season field trip to Chicago’s Field Museum with WTP teams from Bateman and Nixon as a fun way to bond before spring season! UI Program Associate and Coach at Nixon, Camila Giraldo, shares some highlights and special moments from the day. 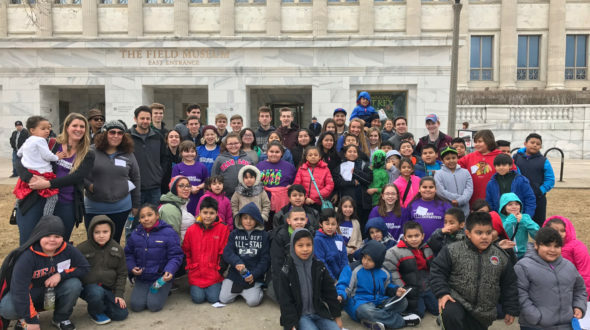 Saturday, February 11th, UI’s High School Board came together with our teams from Bateman and Nixon to explore the Field Museum. After getting our busses through the busy Auto Show traffic, very excited players, parents, and student board members congregated in the Siragusa Center ready to start touring the exhibits. Kids munched on bananas and granola bars while we waited for everyone to check in and get a name tag. We played a quick round of Rock, Paper, Scissors All Star that immediately filled the lunchroom with cheers, camaraderie, and smiles from all sides. We then split everyone into small groups with staff, high school board members, parents and players. Each group got a scavenger hunt worksheet to get through, full of fun tasks like taking pictures posing like a mummy or explaining why conservation is important. Each group got to explore the exhibits in the museum to complete the activity before lunch. It was many of the kid’s first time at the museum, and were excited to explore all it had to offer. Our group started off at the top, on the 3rd floor and the kids were instantly amazed by a case showing Sue’s real head. Afterwards, we all came back to the lunchroom and toasted to a great museum exploration with subway sandwiches and orange juice. It was great to see students from the different schools interact and get to know each other and make new friends. Huge thanks to our parents, coaches, and Student Board for helping make this event so memorable and enjoyable for our kids. What a great way to kick off our spring season!